As people across South Africa question whether there will be load shedding in the coming months and years, others are in the unenviable position of not having ready access to power. Necessity is the mother of invention, and where services are not widely available, many small businesses are stepping up to fill the gap. One of the innovations hoping to do so is a new version of the SolarTurtle - an award-winning solar energy hub developed by Cape Town engineer James van der Walt and his team, which is being unveiled at the Home of Compassion in Delft, Cape Town at the end of June. The Home of Compassion – which has the aim of eradicating unemployment and illiteracy through skills and awareness programmes – is the brainchild of Charles and Delecia George, who have been working in the Western Cape since 1993. As for the SolarTurtle, the latest version of the container-based energy kiosk features automated solar panels that deploy and fold away automatically for transport, or if there is any kind of threat, like wind storms, protests or anything else. Like the Transformers from the big screen, it transforms at the click of a button into a neat, safe and secure button. It retreats like a turtle into its shell – hence the name SolarTurtle. The purpose of these solar energy hubs is to provide secure, reliable green power to communities in areas that otherwise have little access to electricity due to any number of reasons, such as rural location, limited infrastructure or social issues such as crime. Van der Walt describes SolarTurtle as a "social business" that uses the power of renewable energy to empower those who need it most. By creating safe spaces to work from, he explains, these energy hubs "ignite the potential" that is otherwise locked away. "Our new Turtle design is unique and is very much a home-grown South African innovation," he says. 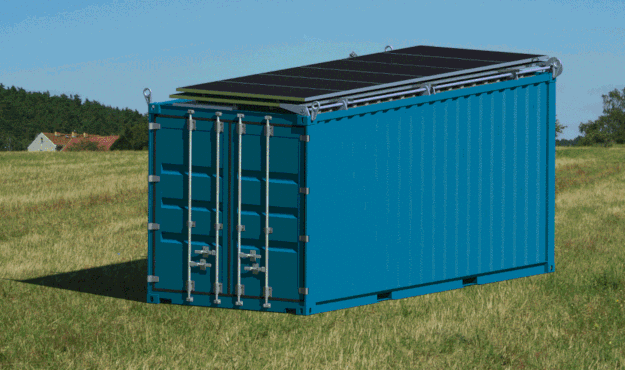 The Turtle's purpose-built mounting system allows the solar panels to fold away snugly onto the roof of the container, meaning users can deploy the container anywhere and move it again the following day if need be. This means it can be used in emergencies or during disaster recovery, where access to power is crucial. According to Van der Walt, his vision is also to use the Turtle for drop 'n go clinics, ICT labs or rural offices. The team is working on a large project for Lesotho and is building a prototype for a community centre in Delft, Cape Town, he says, where the container will be used as a solar battery charging station for phones. It will also be used for a tailoring business. The power from the sun will also flow into the rest of the community centre, reducing reliance on Eskom, says Lungelwa Tyali, the organisation's general manager. The new version of the SolarTurtle, like its predecessor, aims to address a need. One of the changes introduced is an automated system, which builds on the lessons learnt during a pilot of the SolarTurtle deployed at a rural school in the Eastern Cape. Here, the first container served as a publicly owned energy kiosk. Learners from the school were able to charge their phones, buy and use internet vouchers and access rechargeable LED lights for studying. In 2016, the school where the pilot was hosted was annexed by an angry mob protesting against lack of services in the area, Tyali says. The ladies working in the container energy kiosk had no time to use the original, manual system to fold away the panels. So they simply locked themselves inside the container and waited. During the course of the protest, the solar panels – which aren't cheap – were exposed to rocks, fires and other hazards. The situation ultimately was resolved peacefully. But a lesson was learnt: it was clear there was room for an automated system. Enter the new design, which reduced costs and complexity of the system, and improved security and mobility. The SolarTurtle team say they are hoping to serve many more off-grid communities with safe, secure and easily accessible power. Innovations like the SolarTurtle stem from entrepreneurs identifying a social or societal need, and developing products and solutions to meet that need. As a nation with good infrastructure and access to decent education at a tertiary level (albeit expensive), we are well poised to make a shift from our traditional economic anchors of mining and related sectors, to a more knowledge-based economy. Small businesses are leading the way in this innovation space, driven by social entrepreneurs like Van der Walt, and they may just hold the key to unlocking our rich potential and addressing the socio-economic challenges that neither 'big business' nor government seem able to.